Zoom Player is the most Powerful,Flexible and Customizable DVD and Media Player for the Windows PC platform.Using our powerful Smart Play technology, more image, audio and video media formats play with less hassle, increased stability and better performance.Its fullScreen navigation interface is based on a simple 5-Key system (up/down/left/right/select),giving you easy access and navigation to such interfaces as Media Library, File Browsing, etc. ...... Play History and many more. The system's simplicity makes it ideal for users with no previous computer experience. Qweas is providing links to Zoom Player Professional 8.1 RC2 as a courtesy, and makes no representations regarding Zoom Player Professional or any other applications or any information related thereto. 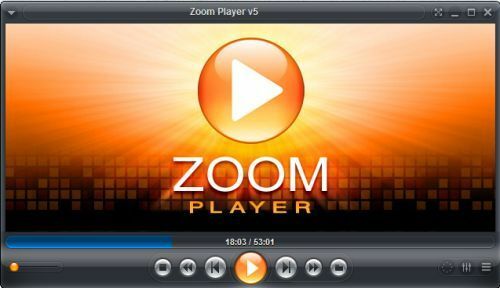 Any questions, complaints or claims regarding this application Zoom Player Professional 8.1 RC2 must be directed to the appropriate software vendor. You may click the publisher link of Zoom Player Professional on the top of this page to get more details about the vendor.